Meals on Wheels is a national non-profit that provides meals to elderly people or other people in need who are unable to provide for themselves. 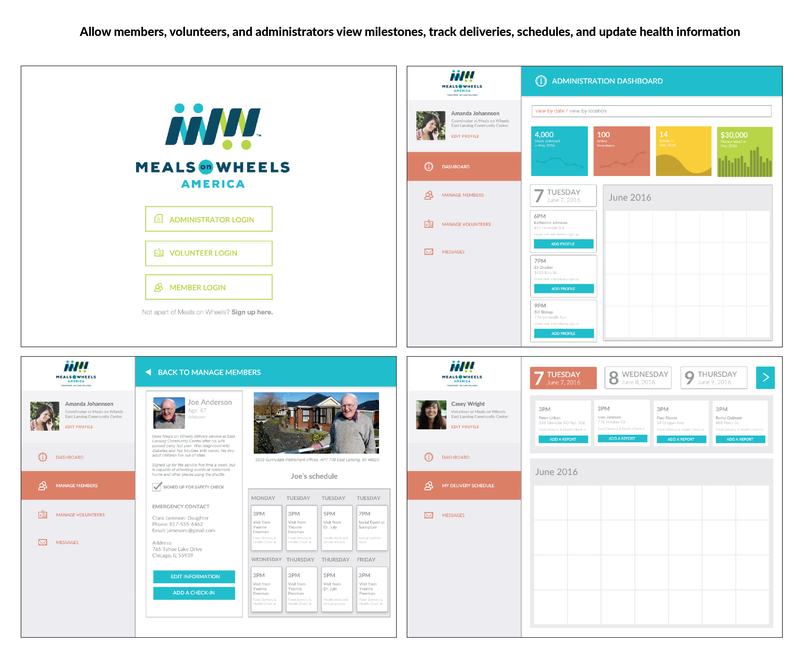 Working with a service design team, I evaluated the service of Meals on Wheels by weighing the services provided to the elderly against the people working and volunteering create the service. This was in order to be able to approach the service in new contexts and provide solutions to various services to make the experiences flow better. After research was completed, we worked to tackle a specific area of the service and make interventions, digital or not, to improve the service for people receiving and providing the service. I lead the research and translation of data through interviews, cognitive walk-throughs of various MoW sites, heuristic evaluations, and creation of various service maps to evaluate pain points and room for improvement of the technology, procedures, or communication tools. One of the main things we needed to research and keep in mind was the people who provided the service and how they interact with the service in different ways. 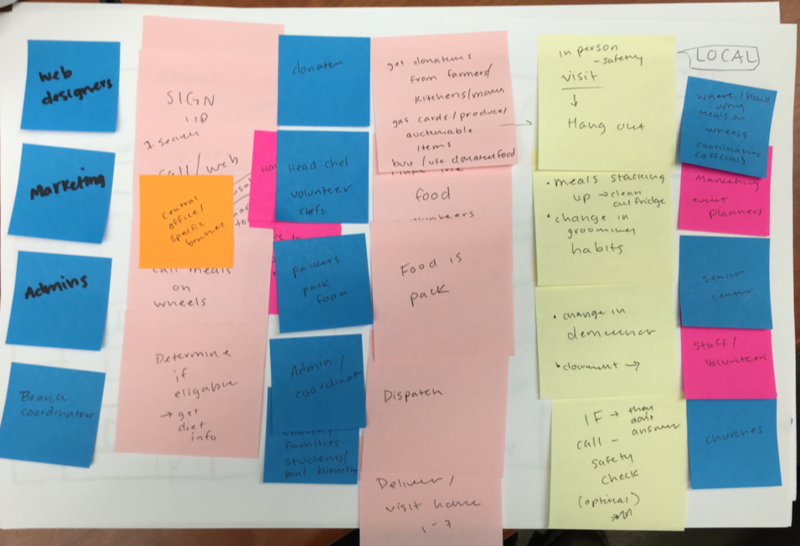 We collected data throughout a couple of weeks, where we documented the research and complex data sets via mind-mapping, affinity diagrams, and making service flows to connect patterns of the data. As a team, we met to visualize and walk-through the experience in various ways. Once we laid out the service in flows, we knew we needed to be able to make a map that was readable and understandable for a regular person who wants to learn about the service. We decided to split up the service by three sections: meals creation/delivery, social events, and check-in processes. 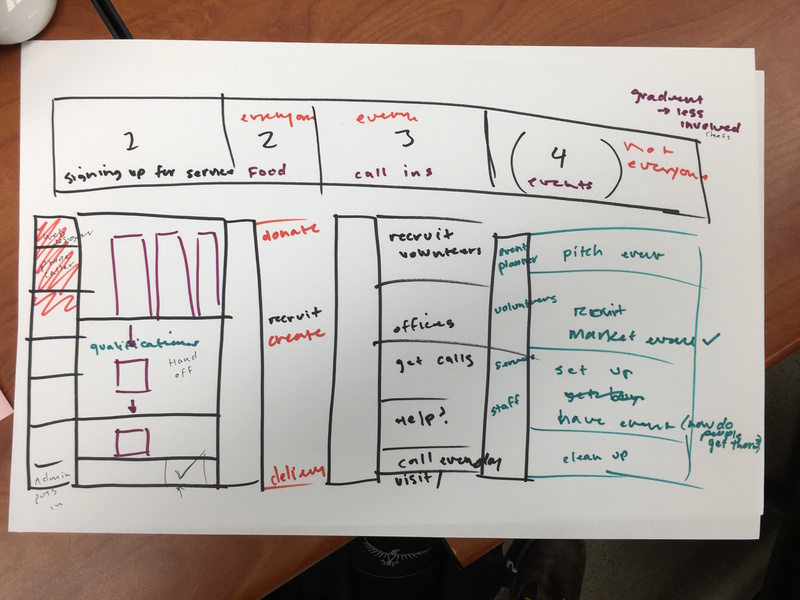 Later, we shifted the sections based on feedback and further research, but this service ecology helped us learn a lot about the admin processes and how volunteers interact with staff and elders. 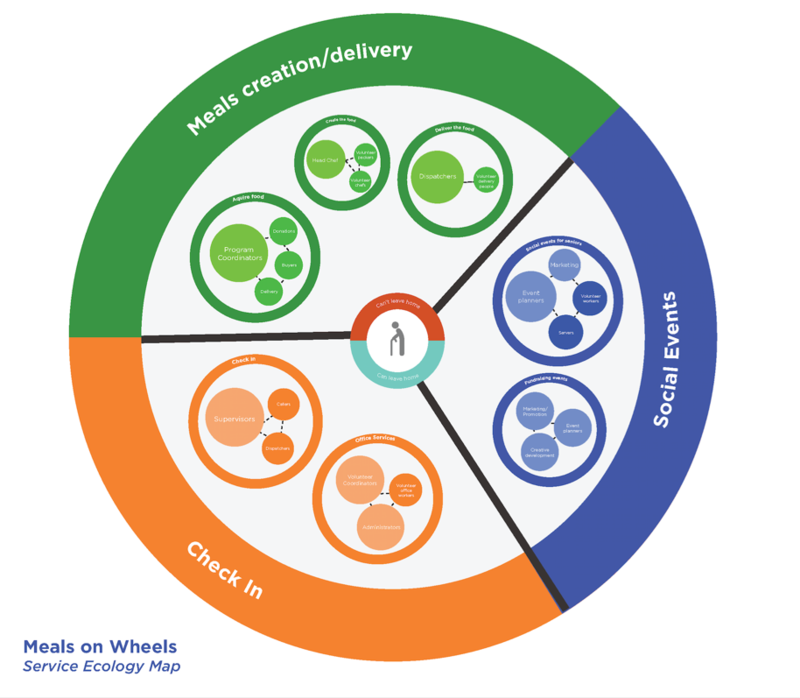 After we had a strong idea of the ecology of Meal on Wheels, we also ran through various websites and evaluated them against each other in regards to usability and find-ability of the most important information. This helped us walk-through the service as a normal user and see how a typical user might use the site to sign up, ask questions, or contact a local branch. Then we thought through the process of receiving check-ins and getting food delivered. The blueprint was created so that the service, which was being used – the blocks on the blueprint – by stakeholders, elders, and their families, and the people – the people icons on the blueprint – who create and implement each service. We decided to structure the map in the way so that the service was split up in three sections: signing up for the service, creating and delivering food, and creating and attending social events. The stakeholders/actors were placed on the side and matched with the blocks in which they create to implement a service. The main blocks were structures so that the complexities were shown and choices between type of services were conveyed in each section. Above the service, the section showing the actors’ interactions with the service was shown through mini-representations of the service ecology map. As a team, we reflected on the service as we mapped it out in different ways. Through these exercises, we were able to understand the service extensively, and even notice some gaps in the service that could be improve by physical, technical, or administration interventions. For example, one issue we found was that since the Meals on Wheels services were dependent on each local branch, families or members have to self-search via search engine, through the main Meals on Wheels website’s branch search, or through word of mouth. But through any of these methods, we found that it can be difficult to find appropriate branches for a person’s desired service and location, and once they find a branch, navigating a whole different website to find contact information can be difficult, especially if they’re being refereed from another site completely, that has a whole different navigation scheme. We also noticed the issue of communication and tracking schedules. Some members would confuse their daily schedules, or volunteers were unaware of health or needs for certain services at their daily visit. We brainstormed a solution that streamlined all of the processes of managing members, volunteers, health information, and schedules into one place. Members and volunteers could sign up on the same application and easily find branches and services that fit their needs. We thought making a version for each type of person made it easier to track information and make sure everyone is being serviced or know what the need to do to fulfill their duties. Also, we thought the check-in process could be simplified and be tracked, so that when new volunteers come in, they are aware of who the people are they are servicing. We mocked up wireframes for a dashboard that allowed for each type of user to manage information, track progress, view schedules, addresses, and health information about members. Administrators would be able to track new members, schedule visits, create member health information, and dispatch volunteers for delivery or check-in. We created a type of “customer card” for members so that administrators and volunteers to view health and schedule information and also add new info about members after each visit. This helps later when tracking health and moving away from the typical paper-lead model that the non-profit currently has. Keeping all of the information in one space helps people better understand the people they’re servicing, improve communication between members, volunteers, and admins, and make the experience of Meals on Wheels more optimized for all types of ages. I created the prototypes in Adobe Experience Design, and recorded the prototype inside of the application, with some minor editing in Camtasia. Overall, the learning process was eye-opening. I was able to evaluate a service from only knowing surface information to fully being able to map out the experience in ways that showed who was carrying out what service, what issues were arising, and how it all comes together as a full experience. 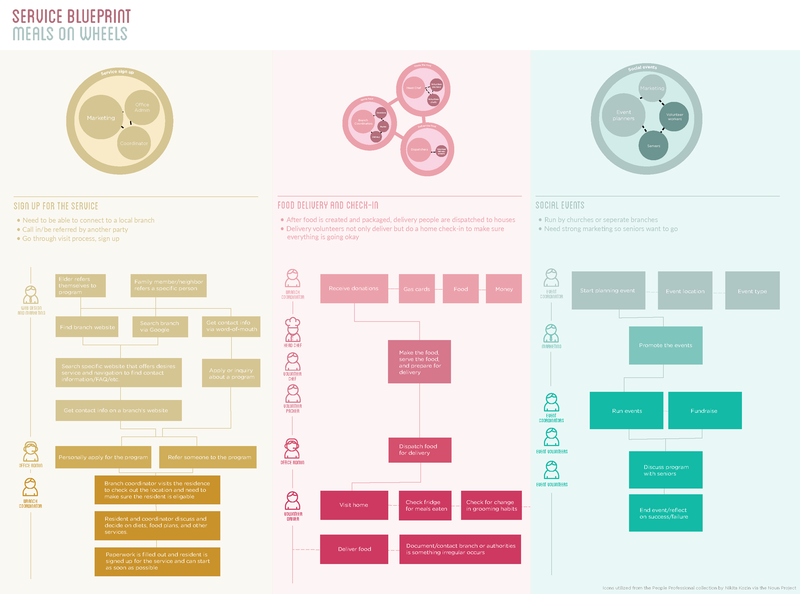 Redesigning the service by creating this application also allowed me to piece together so much lost and disconnected information that currently impedes rather than flows. 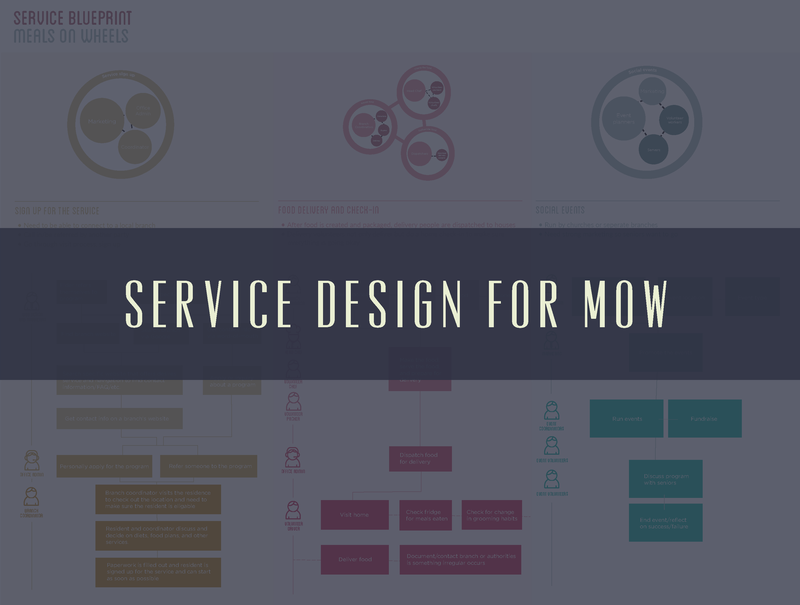 Redesigning services, for me, is something that I am greatly passionate about, and making experience usable and more pleasant for all ages makes my career path even more wonderful.